There’s a new kid in town, and she’s a mean one. I’m talking about STRAF_WERK, a new concept on December 2nd by two house lovers who want to bring both a feeling of solidarity and hands-in-the-air moments back into the clubs. They’ve kicked off their new concept with a line-up that can only be described as insane. I myself thought this kind of all-star programming only happened in Berlin and Ibiza, or maybe during ADE.. Guess its our turn Amsterdam! We were there when David August played a killer set in the tiny NDSM-bar Noorderlicht earlier this year, during his epic set at Pleinvrees and we were at both sold out Diynamic label nights in Studio 80. I guess you could call us a fan. Best way to introduce you to Mr. August is by just pointing you to the monster hits he had this year, such as Moving Day, Hamburg is for Lovers, Roco Coco or his latest True Romance. If you want to experience the current state of house, go check out Tale Of Us. The Italian duo are part of the crew behind immensely popular record label Visionquest and have released a few remixes over the summer that left a huge impression in ways of praise, airplay and record sales. Anyone who doesn’t recognize their remix of WhoMadeWho – Every Minute Alone must’ve spend 2011 in Tibet. If their year wasn’t big enough yet, they were also asked to make a Resident Advisor podcast in October. Break through artist of the year? A little less known in these parts of the world is Till von Sein. This multi talented man works as an agent for many infamous German DJs, but is also a successful DJ/producer himself. He has an album coming out on Suol featuring collaborations with Fritz Kalkbrenner amongst others. We had the pleasure of seeing Till DJ in Berlin this summer and the sweat was dripping from the sealing at Suicide Circus. Don’t miss this! Not convinced yet? 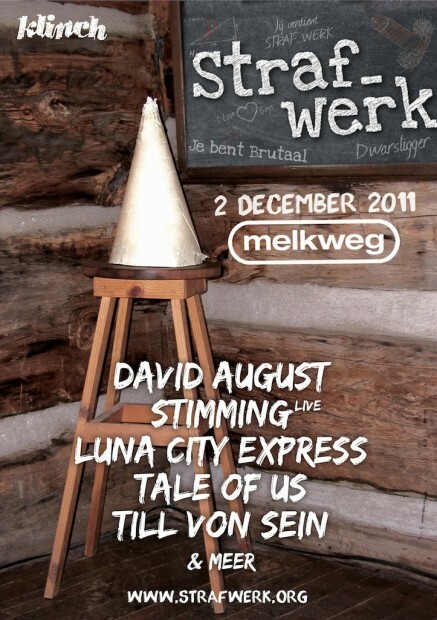 They also promise a wide range of side entertainment ranging from visuals to acts, all in the STRAF_WERK theme. Best detention ever!